I don’t often machine knit these days but I’ve just finished a jumper for my partner. This is made from a lot, but not all of, my 4 ply ends of cones and part balls. The colours went together better than I had thought they might although it is not so subtle. I ended up weighing all the colours so I could split them to even them out between the front and back and sleeves. I reckoned that about half the weight would go into the back and one sleeve and half into the front and one sleeve. I knitted both the sleeves so that they are the same and the back and front up to the underarms, but above that, the back and front are different. It’s all machine washable wool, or 75% wool/25% polyamide, that is a sock wool so it should wear well. I brought it with me to California where we are visiting family at the moment, thinking it wasn’t going to be worn but I was wrong as we’ve been on the Pacific where it is notoriously foggy and cool. So it travelled out in the bottom of the suitcase with all the ends waiting to be darned in, and then got finished and then given as a birthday present last week. And it’s been worn almost every day so far. I love machine knitting as it’s quick. It’s also a different craft from hand knitting – it’s hard work, noisy, technical and unsociable. There is a lot of prejudice about machine knitting and it has to be said that a lot of it is not well designed but if it’s thought through there’s no reason why it can’t be completely acceptable. I’ve spent all day trying out yarns and patterns on the knitting machine with a view to making more pairs of gloves in less time, so that I can explore some of the ideas that I have waiting to be executed. However, as can be seen from these pathetic scraps, success has not been mine today. The top image includes pieces made in scrap yarn, acrylic, the only thing I would consider using it for, while the bottom image shows two pieces that might at least have some potential. It’s how the fine pure wool yarn behaves in a two colour structure that’s causing the problems. Perhaps this is easier to anticipate when hand knitting it. Although I think the particular yarn does not handle well. It’s a British wool 3 ply and very springy. I made a red and black striped jumper for grandson one before Xmas. It was actually a late birthday present and at his request. It was quick to make, in King Cole machine washable pure wool 4 ply. Although not cheap, the colours are good and I know it will last. I used my very old Mary Weaver book for the basic pattern which I have used constantly over the last 20 or more years. Mary Weaver died a little while ago and I never met her, or contacted her to tell her how good I think her books are. I am sorry about this, and resolved to tell people when things are good from now on. Using the machine for a Dennis the Menace jumper for grandson. Love machine knitting. So fast! 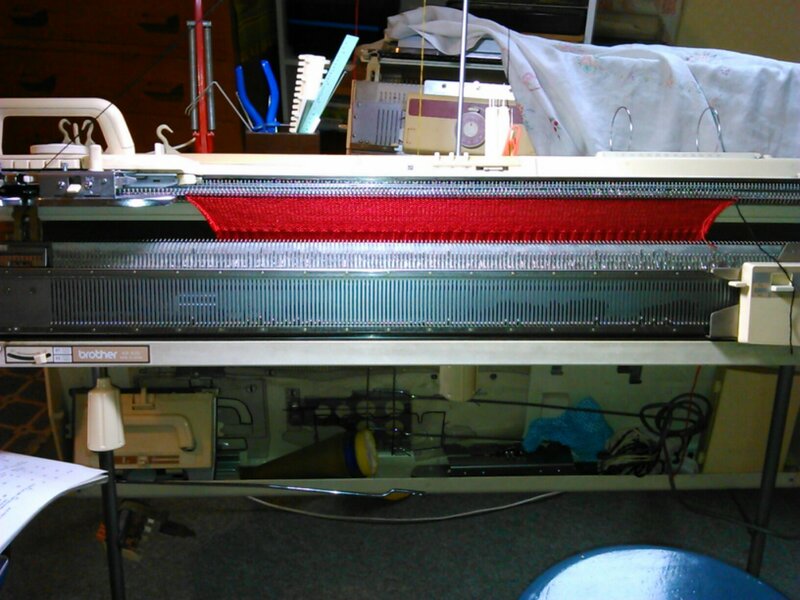 I got the knitting machine out last week in response to finding a pattern for a Blue Peter jumper in the collection of the Knitting and Crochet Guild. My London grandsons were very enthusiastic about this and one of them set to with graph paper and the Mylar sheet to transcribe the galleon motif for the machine. He then knitted the test piece. A trip to Texere in Bradford sorted out the yarn, machine washable 4 ply from King Cole, pure wool, and a day on the machine produced the garment, see below. So now there’s just the matter of another one in black and red for big brother. That’s Wednesday’s job. The second jumper, with a high V-neck by request from the recipient. The yarn is machine washable wool by King Cole, merino blend. Not cheap and in quite good colours. Hello I am trying to find an easy to follow pdf pattern for knitting fingerless gloves on a brother punchcard machine – I need to find really very simple instructions as I am only knitting for 4weeks – I have managed lots of samples and a scarf but need some help please! A rectanlge knitted straight and then seamed up the side with a gap for the finger will make a good pair of simple fingerless mitts. Have you tried looking on Ravelry? See also my blog post – Machine knitted glove from November 2015.
thanks i don’t know how i missed that Machine knitting guild pattern – need to practice my searching skills aswell as my knitting!